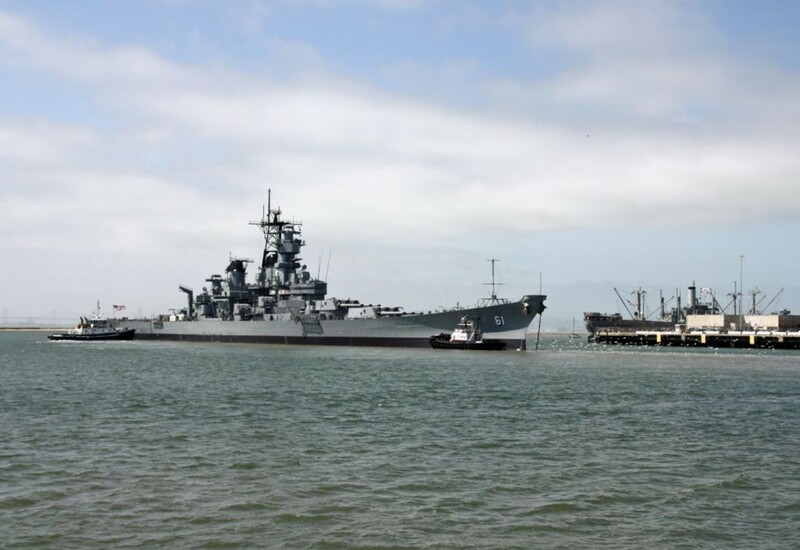 Iowa arrived at the Richmond cargo handling pier on 28 October 28 after many years of having been weather-beaten in the mothball fleet at Suisun Bay. 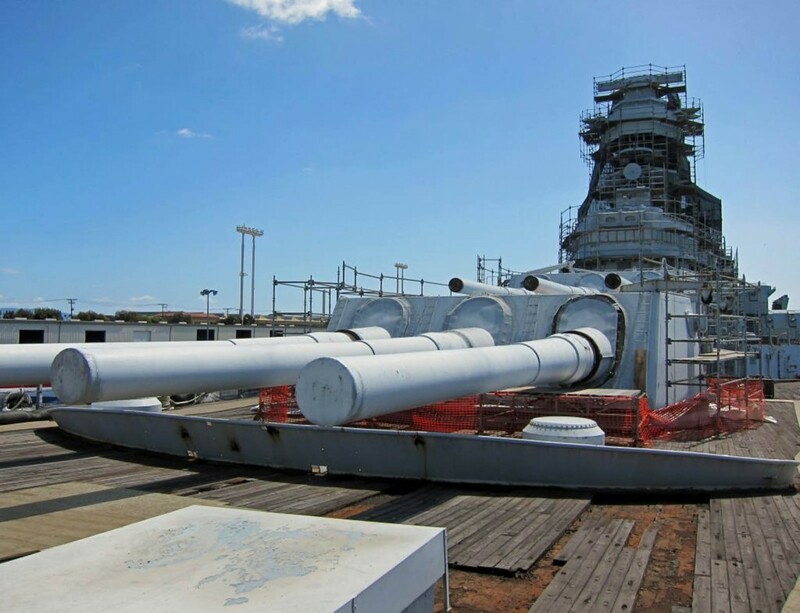 The staff and volunteers of the Pacific Battleship Center (PBC) worked through the winter and spring on initial restoration projects, including a complete outside paint job. Photo 1 (see images below) shows a few of the many restoration challenges. 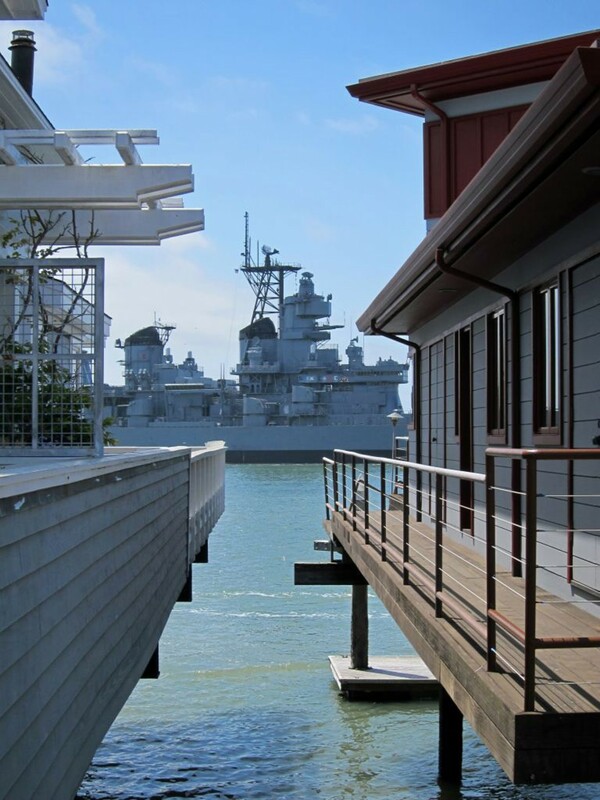 In late 2011, PBC opened the ship up for public visitation on weekends, mainly just the forward weather deck. 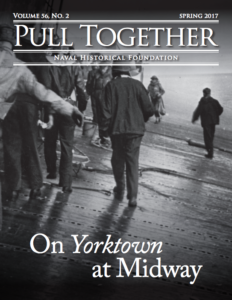 After seven months in Richmond, at roughly 10am on 26 May, the mooring lines to the pier were cast off (photo 2). 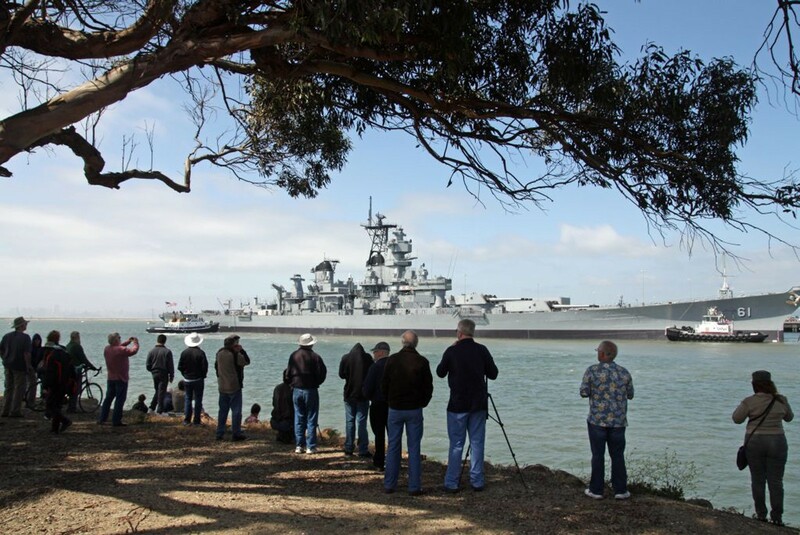 Several harbor tugs gently pulled Iowa free as many onlookers watched from various vantage points (photo 3). 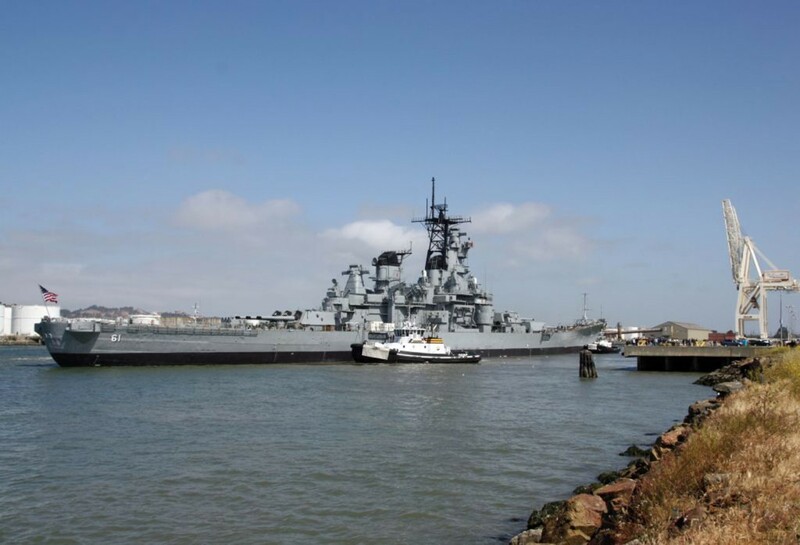 If one looks at the “arrival” photos from 28 October, it is immediately apparent the volunteers and crew of the PBC did a magnificent job of fixing up Iowa’s exterior, painting the entire ship as well as replacing the mast atop her superstructure. 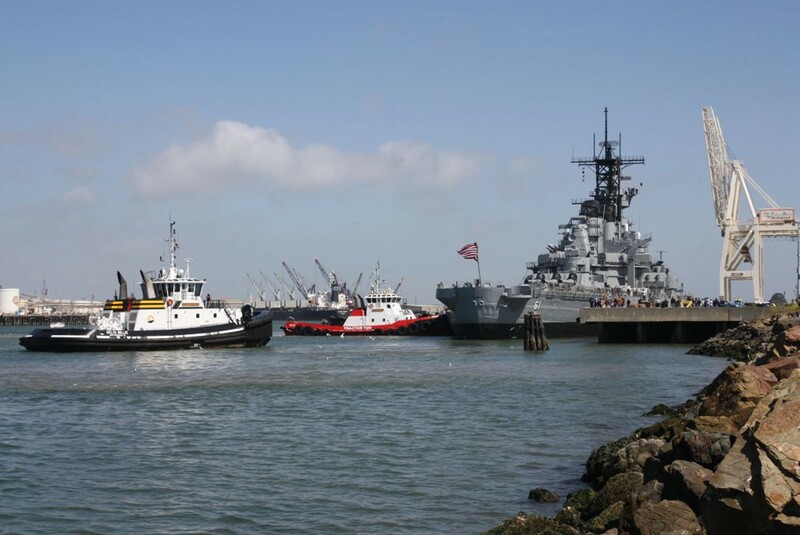 Several tugs guided her stern first down the narrow cargo-ship channel until reaching a turn-around basin (photo 4), near where the WWII Victory ship SS Red Oak Victory is moored (photo 5). 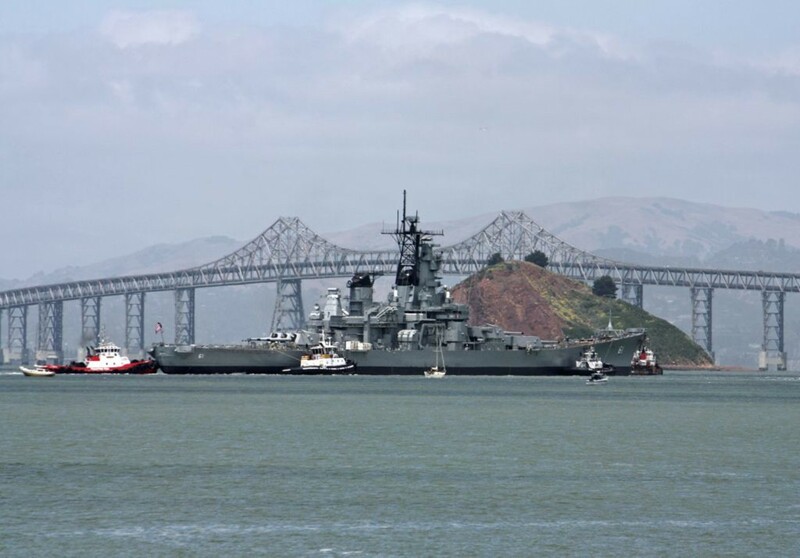 After turning Iowa about 90 degrees to port, she was lined up with the main shipping channel connecting the Port of Richmond with the San Francisco bay. The entourage then paused to allow the ocean going Crowley Maritime tug Warrior to be hooked up to the main tow line for the 450-mile mission. 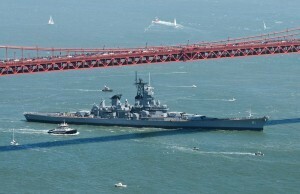 With the blast of a few ship horns in salute, Iowa departed for the open Bay waters. Along the way, the channel narrows at a sand spit with a few homes perched on it. The folks who were home today were treated to a most unusual sight out their living room windows (photo 6). 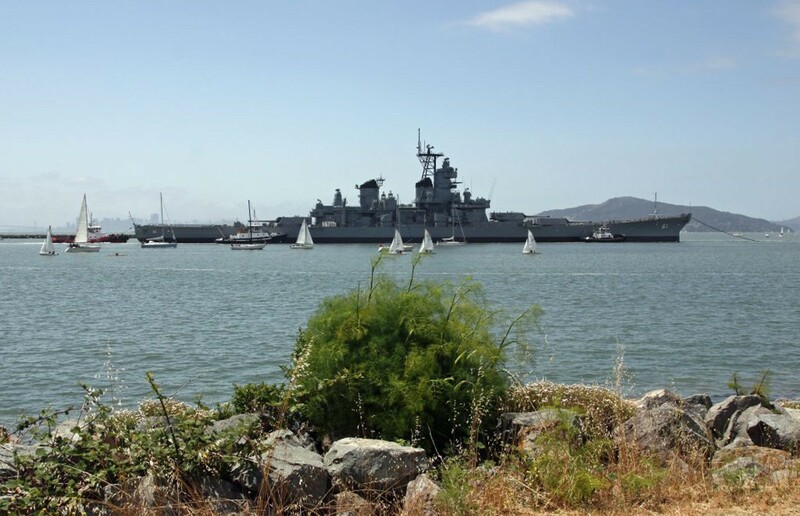 As the group of ships entered the main bay, a flotilla of sailboats, power boats, tour boats and other private vessels surrounded them (photo 7). 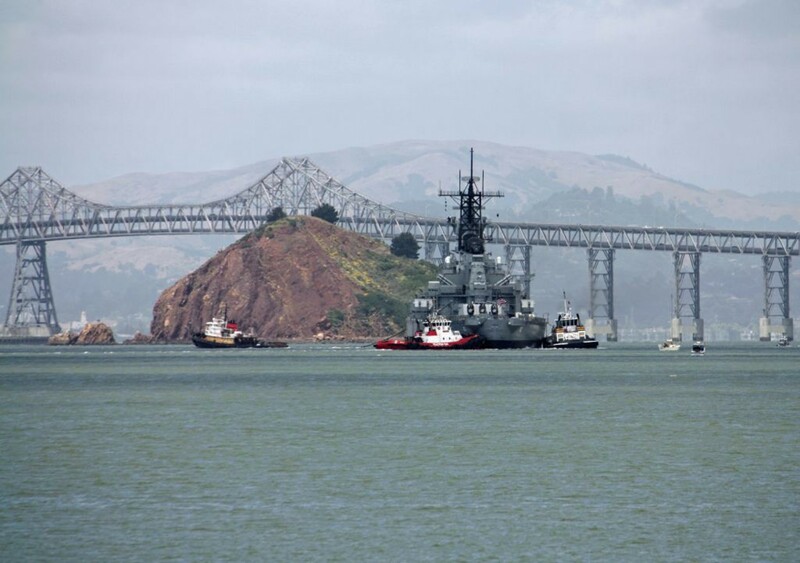 Iowa was towed out into the center of the northern part of the bay, just south of the Richmond-San Rafael Bridge, and then rotated 180 degrees so she was lined up with the deep water shipping channel (photos 8 and 9). 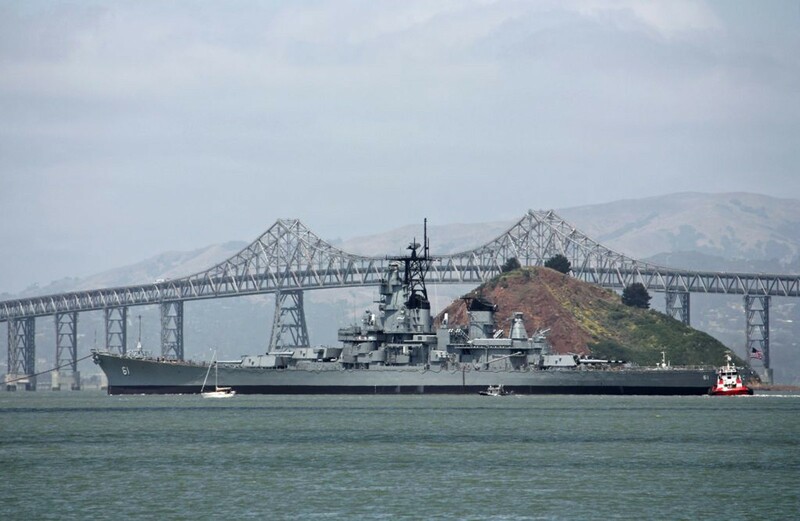 Warrior then revved her engines and began heading towards Alcatraz Island and eventually the Golden Gate Bridge to exit the bay (photo 10). 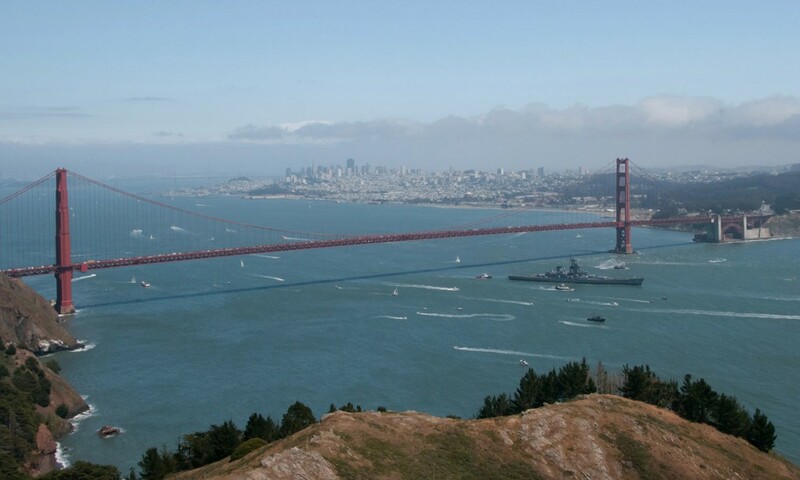 A friend of Bob’s, photographer Susan Wood, was positioned just outside the Golden Gate Bridge at the Marin headlands. 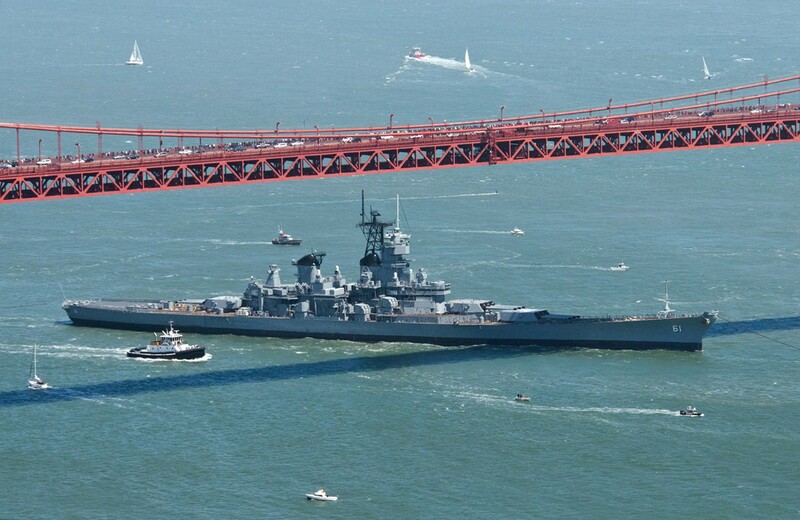 She got a nice photo of the crowds on the Golden Gate Bridge saluting Iowa as the ship was towed underneath (coinciding with the 75th anniversary of the opening of the bridge) as shown in photo 11 (above right). Finally, the moment arrived for Iowa to pass underneath the bridge (photo 12) and be on her way down the California coast to her new home in Los Angeles.